By following the above five words from Butler, investors can help simplify their complex financial lives. Out of thousands of pages of scientific research, a cornerstone of evidence-based investing emerges: Control what you can control. Control the fees you pay and your trading costs. Control your tax efficiency and your asset allocation. Control how closely your emotions are tied to an up-and-down market. Bigger picture, you can take better control of your entire financial experience. This month's InFocus looks at foundational tenets of evidence-based investing to give you confidence when you think of where you are and where you want to go. "Diversifying your wealth across a variety of market risks helps you remain on course and in the driver's seat, even when the road ahead is uncertain." For an example of why we stress the importance of having an internationally diversified portfolio, just go back a few weeks. The first quarter of 2017 closed strongly for developed international and emerging markets (up 7.4 percent and 11.5 percent, respectively). This came when many investors had cooled on international stocks after they significantly underperformed U.S. markets from 2008-2016. But not so long ago (2002-2007), the MSCI World ex USA Index returned 128.7 percent compared with 42.5 percent for the S&P 500 Index. Diversifying your portfolio so it has exposure to both U.S. and global equity markets allows you to capture market upswings and withstand its downswings over the long haul. 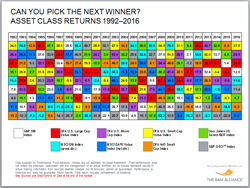 Click here or the image to see the up-and-down nature of various asset classes on a year-by-year basis from 1992-2016 as well as their 20-year annualized averages and the single best and worst years of these classes from 1997-2016. All of this underscores the importance of being diversified and -- the topic we'll address next -- being disciplined. Buffett is really smart and really good at making money. But he makes an important point when it comes to someone having the ability to outsmart the market. "Success in investing doesn't correlate with IQ. Once you have ordinary intelligence, what you need is the temperament to control the urges that get other people in trouble investing." Too many investors buy stocks during upswings when all feels good and sell during downward spirals when uneasiness seeps in. This lack of discipline can cause investors to be on the sidelines when markets rebound, causing missed opportunities. 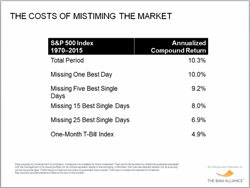 Click here or the image to see the cost to investors when they miss the best one, five, 15 and 25 days of market performance during a 45-year period. Patience and prudence are central to an evidence-based strategy. Stay true to your well-devised plan while rebalancing periodically. Doing so will keep your portfolio in line with your target allocations and will enable you to capitalize on buy-low/sell-high opportunities. Swedroe, a prolific author and the director of research for the BAM ALLIANCE, says the ability to take risk is largely defined by the investment horizon, the stability of an investor's income and the need for liquidity. Swedroe says the willingness to take risk can be succinctly summed up through the "stomach acid" test. Can you stick to your plan even when the market goes down for an extended period? This includes rebalancing -- selling what has done relatively well or held its value and buying what has done worse. The need to take risk is determined by the rate of return that is needed for you to reach your financial goals. Of course, the word unique is critical as well. The ability, willingness and need to take risk are highly personal decisions. They vary for each investor's specific circumstances. 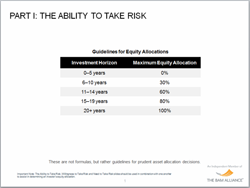 However, you can view general guidelines for prudent asset allocation decisions by clicking here or the image. No room for speculation, prognostication or hunches, the evidence-based world is rooted in decades of objective research on the long-term behavior of financial markets. We use that evidence to tilt portfolios toward the asset classes that have delivered the highest returns over the long haul and should continue to do so. 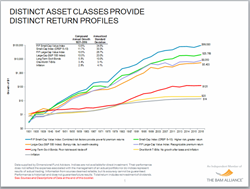 Click here or the image to see the return profiles of distinct asset classes during the period of 1931-2016. This research leads to plans that keep costs low, minimize risk and implement tax-efficient strategies. The evidence results in portfolios that are diversified domestically and internationally. Those same portfolios use fixed income to dampen volatility and address the risk tolerance of each investor.